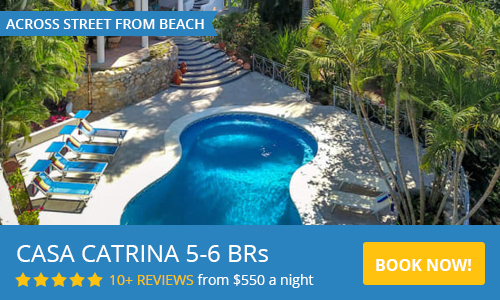 Brisa del Mar in Sayulita is steps from the beach. Enjoy the beautiful view of the beach and ocean from the comfortable living room sofas, and from the great furnished palapa patio built outside. Enjoy your afternoons sipping on a margarita and cool off in the beautiful shared pool. The Los Delfines complex consists of only 6 vacation rental villas and the common areas include 2 swimming pools, which gives you plenty of swimming space. This beachfront complex is located in the exclusive North Side of Sayulita. The beachfront location means no steep hills to climb and a flat easy walk to town. The casa has a maid coming every day except Sunday (included in the price). The built-in sofas are comfy and sturdy enough to double as beds in a pinch. A fully equipped kitchen with refridgerator, oven & stove, microwave, toaster and coffee maker, provides you with everythign you need to make delicious meals at home. The dining tables both inside and outside on the patio are perfect for family meals, with a breakfast bar for ejoying morning smoothies or a light snack. A washer and dryer is available in the back. The master bedroom has a king-size bed and an enclosed bathroom, 2nd bedroom has a queen-size bed, and 3rd bedroom has two twin beds. The second and third bedroom share a bathroom. The living room opens up to a patio with palapa (thatched palm) cover, with chairs and lounges and a pool just outside the door. Brisa del Mar is a quick walk to all Sayulita restaurants and shops. This is the 4th house I've rented in Sayulita and I have to say it was the best yet! We were 2 couples with 3 children under 4. Plenty of space to accommodate our group. We loved having the view of the ocean from our living room / back patio and the small pool out our front door. The house was exactly as it was described. Would definitely book again! Excellent location, wonderful unit and terrific staff. General location: on the edge of downtown for convenience, but a quiet oasis away from the hustle and bustle. Specific unit location: terrific view of gardens and ocean, but the outdoor patio is nicely private. Very close to the ocean, so easy for individuals to come and go - particularly nice having a baby in the group. Outdoor living areas: very comfortable and spacious for both lounging and eating, with plenty of both sunny and shady areas for most of the day. Indoor living areas: very comfortable, spacious, well-furnished and attractively decorated. Bedrooms and bathrooms: spacious and comfortable. Kitchen: very clean, well organized and moderately well-equipped. Suggestion: add a juicer gadget for all the great fresh fruit. Overall condition: very good. We found a couple of small maintenance items, but they were promptly dealt with by the staff. Staff: very capable, helpful, knowledgeable, friendly and responsive. We hired a couple of them to make an excellent dinner for us in the unit. Security: seems quite good, including a security guard patrolling at night. Owner/manager: Mark was very easy to deal with, provided tons of useful information in advance. SUMMARY: overall excellent accommodation at a reasonable cost. We stayed at Brisas Del Mar with our three teenage sons for 2 weeks and had a wonderful time. The house is perfect, with plenty of space for everyone to relax. The master bedroom is very spacious. You will find everything you need to cook in the kitchen although you might be tempted to try many of the excellent Mexican restaurants in town. The view from the kitchen/living room is even better than on the pictures. We spent many evenings on the deck watching the sun sets, it was magical. The cleaning lady comes everyday, except Sunday, washes the floors, makes the beds, cleans the dishes and provides new towels whenever it's necessary. 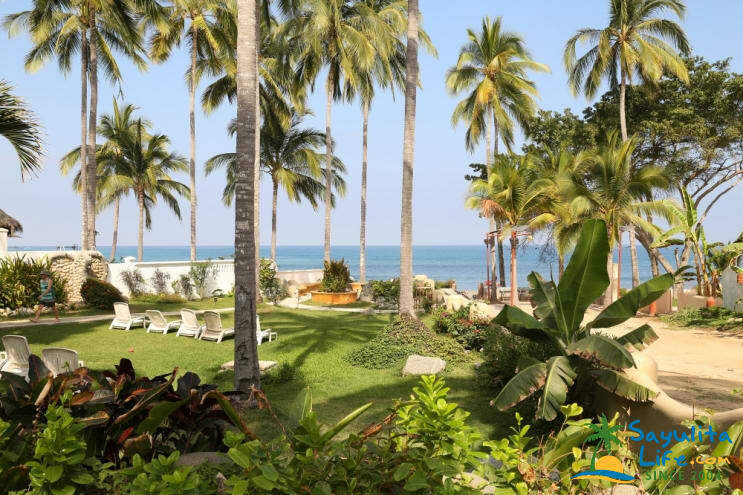 Los Delfines is really the best location in Sayulita, in a quiet neighborhood, right on the beach and just a 10-minute walk from all the downtown action. The beach in front of the house is quiet and not crowded, compared to the south side of the river. The 2 swimming pools on the complex are cleaned every day and were very popular after the beach. We were traveling with 2 other families who stayed on the complex at Sierra Azul and Rosalera. We were 30 seconds away from each other, Los Delfines offers great possibilities for groups traveling together. We would greatly recommend the complex to anyone traveling to Sayulita. Lovely house! Perfect for multi-generation travel. We stayed at Brisa del Mar with our two young children and their Grandma and Grandpa. The layout of the house was excellent for our party, and the patio area that opens completely to the house is secluded and easy for the kids to play outside while adults are inside. The kitchen is well appointed and the house has beach chairs, umbrella and sand toys for the kiddos. The only drawback to our trip was a very loud wedding party in the house to the north of us, which cost us a couple nights' sleep as we were in the front bedroom. Didn't seem to bother anyone in the back bedrooms. A great vacation and we would return! Stayed for five nights with our friends and family, ages 25 to 92. Place was nicer and setting more spectacular than the pics show! On location staff was excellent, from the daily maid service to a wonderful meal cooked by Sofia. My husband, 2 teenage sons and I spent a fabulous 10 days here in July. It was hot, but that's what we wanted. My sons took surfing lessons, went on a guided fishing trip with their dad, hiked in the forest, rented mountain bikes, we all swam in the ocean and snorkeled aound the Marieta Islands. We walked in to town a couple times each day to eat, look in shops, and check out the beach. We felt like we were in Mexico, not at an expensive resort surrounded by other Americans. The views from the patio & living room were amazing, we could hear the ocean waves from our room. It was glorious to sip a drink while watching the sun set on the Pacific. The beds were comfortable, & blessedly, each bedroom had an air conditioner. The pool was just feet from the kitchen door. Every thing is well maintained, inside and out & the staff was friendly and helpful. The whole time we were there we felt very safe and secure. We stayed here in April 2012 and had the greatest time. The Palapa with a great view of the ocean is unbeatable. Short walk to town with great food even closer at Medusa and Tropical House. The beach is a VERY short walk out the back door and the pool is 10 steps from the front...amazing! The accommodations are both comfortable for a small group and large enough to enjoy with a big group. There is not a better place to stay in Sayulita. Cannot get better than Los Delfines: Brisa Del Mar! We have visited Sayulita 2 times and each time picked a villa in Los Delfines. Brisa Del Mar will not disappoint. For a family of 4 or more with either young kids or teens, it is in a perfect location. The beach view from Brisa Del Mar is fantastic from the palapa, the living room and kitchen. The beach is steps away as is the pool. The staff is very helpful, the unit is very clean, and the walk to town is very short. We will always come back to Los Delfines in the future!